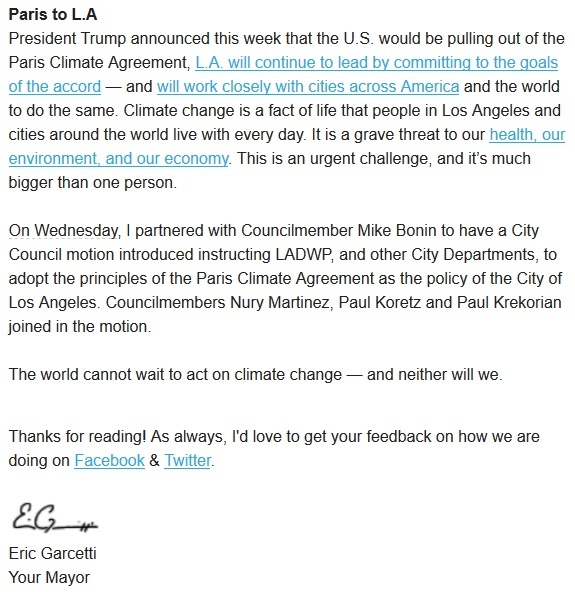 The global government planned long ago by the ruling elite is very much on schedule and today the Mayor of Los Angeles Eric Garcetti served testament to this by announcing that despite president Trump's withdrawal from the Paris Climate Agreement, which has nothing to do with America or helping Americans, the city of Los Angeles "will continue to lead by committing to the goals of the accord and will work closely with cities across America and the world to do the same." What this amounts to is nothing short of a declaration that the nation state of America will not get in the way of the globalists push for a new global order. Below is an image of the most recent letter sent out to residents in Los Angeles. Clearly the mayor's priorities are with the "world" and with the paradigm created by the globalists not with America, reality, science, reason or logic and it's time for conscious Americans to confront this head on. It's not about saying let's trash the planet with pollution it's about realizing the deeper agenda at play here which is a point that is very difficult to get across to the Liberal Left. Either way the globalization plans the ruling elite have set in motion are now very real and very tangible as they unfold before our eyes. 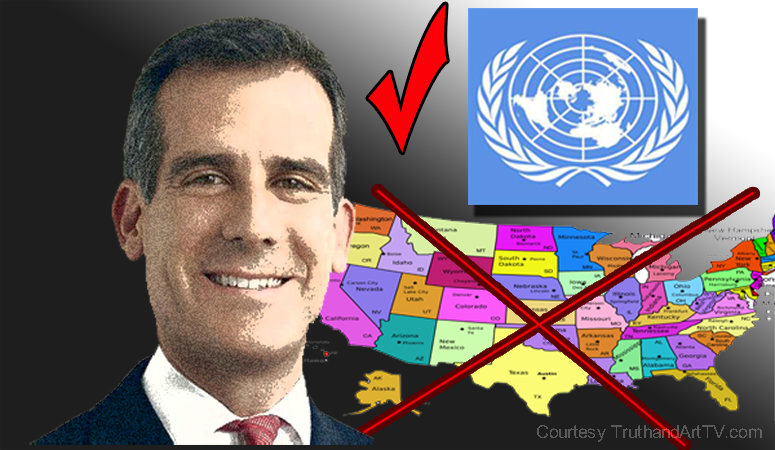 Garcetti points to the "facts" of climate change "reality" as the reason for bypassing the nation state structure and justifying Los Angeles' loyalty to the Paris Climate Agreement instead of the rules, the laws and the power structure of the nation state which it exists under. This is tantamount to slapping every America and US Constitution lover in the face and laughing at them as they role out a new global corporate order which blames and thus taxes and imprisons humans for environmental crimes instead of moral and ethical crimes based on violation of natural law as the spirit of the Constitution suggests. This also clearly reveals why the ruling elite planned and created the global warming hoax in the first place then renamed it to the much fuzzier and blurry "climate change". This is also why not long ago we had Left wing Liberal funded "Earth day" and "science" marches all around the country. This is their way of fighting back against anyone who opposes the global order and this is the Left's way of "resisting" Trump who is now an obstacle to many of their plans. Finally, there are many people on earth right now that don't want you to see this global plan. Instead they would rather you fight with each other over unproven theories, blame nation states and generic enemies for everything from 9/11 on down, blindly accept their technocratic world of self driven cars and smart phones and accept their social engineering indoctrination as normal. At no point in history has the global plans of the ruling elite been more clear and identifiable than today. Help spread this important message so we can continue to fight back with bullet proof solutions to sabotage their plans and restore everything including our own normality, our schools, our communities, our nations and our rule of law.